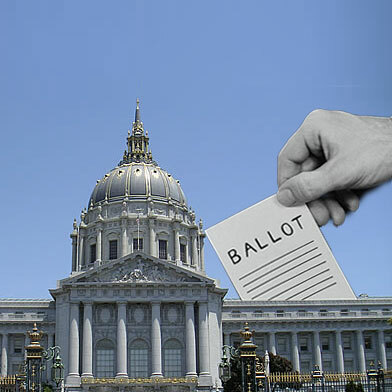 Too many mayoral candidates, boring ballot measures, general apathy — a litany of excuses has been offered for the less-than-stellar 42 percent voter turnout in San Francisco’s November election. Yet voter turnout in at least one area exceeded general expectations: in San Francisco County Jail, where nearly 79 percent of inmates eligible to vote returned ballots, according to Jail Legal Services. And since that figure does not include incarcerated citizens who registered to vote while in jail and released prior to Election Day or submitting their ballots, democratic participation in the jailhouse could have been in fact even higher, according to Nicholas Gregoratos, who oversees the voting program. A total of 315 vote-by-mail ballots were requested by jail inmates, who returned 248 completed ballots to the Department of Elections, Gregoratos said. That’s slightly less than the 500 ballots requested for the 2008 presidential election, but still a better showing than any voting precinct citywide, according to voting records. And of those, 52 voters were no longer in custody by Election Day. “So if you knock out those [from the total], our voter turnout was 90 percent,” said Gregoratos, who happened to run into some of those former inmates at City Hall, casting their ballots. In California, persons in prison or on parole for a felony violation cannot vote, a practice known as “felony disenfranchisement.” Inmates in county jail are typically serving sentences for misdemeanor convictions, though the state’s “realignment” program — in which nonviolent felony offenders are serving sentences in county jails rather than overcrowded state prisons — will lead to more felony offenders housed in county jails. There’s some disagreement over whether a lower-level felony offender should be allowed to vote while either in county jail or serving sentences while in a state-supervised release program, but in an opinion outlined in a recent memo released by Secretary of State Debra Bowen’s office, those citizens should not be eligible to vote. In the meantime, misdemeanor offenders have shown high interest in voting since the vote-in-jail program was instituted some two decades ago, Gregoratos said. Just like the rest of us, jailed voters receive piles of political mailers; unlike the rest of us, every scrap of propaganda is pored over. And despite 2011 being an “off-year,” since it included races for both district attorney and sheriff, “it’s a big deal for jails,” Gregoratos said. Jailed voters can register either at their most recent home address, or in the case of voters who identify as homeless, they may register as residing “at a street corner, like Turk and Taylor,” Gregoratos said (or, presumably, Broadway and Vallejo). All that’s necessary is a valid mailing address, for which the smaller jail at 850 Bryant in San Francisco or the larger jail in San Bruno serves just fine. Residents of other counties can also request ballots from their home constituencies, though it can prove to be a bit more difficult to wade through the bureaucratic hoops of registration and ballot reception. “If memory serves,” just one voter cast a ballot in Alameda County from San Francisco County Jail this year, Gregoratos said.